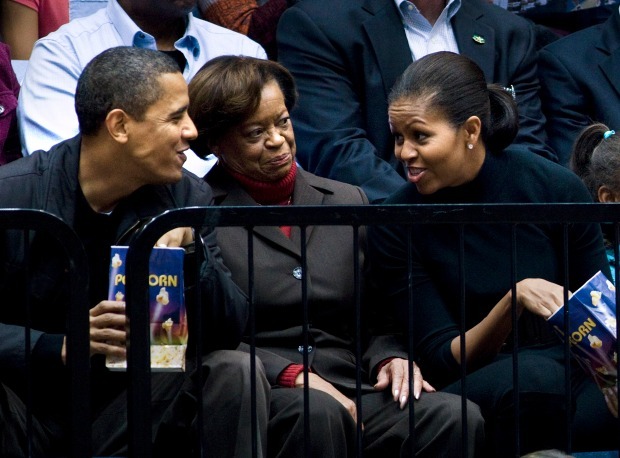 U.S. President Barack Obama (L) watches Oregon take on GW with his mother-in-law Marian Robinson (L), First Lady Michelle Obama (R) and daughter Sasha Obama (2R). Oregon State is coached by his brother in law Craig Robinson. 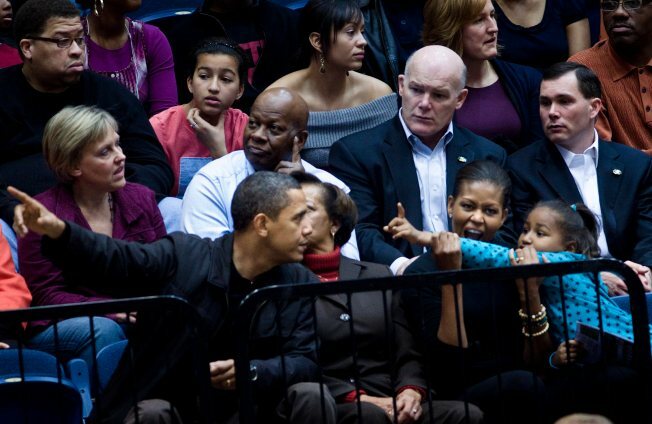 President Barack Obama and family stepped away from the White House on Saturday to take in the Oregon State-George Washington University basketball game. The president, who's been known to shoot a few hoops and even attended a Washington Wizards game earlier this year, went to cheer on his brother-in-law and Oregon State coach Craig Robinson. Robinson's team beat George Washington 64-57 with President Obama and his family watching from courtside in the half-full Smith Center. The First Lady, daughters Sasha and Malia, and mother-in-law Marian Robinson are also there, cheering on the Beavers. The first family nabbed courtside seats at the half-full arena, munching on popcorn as Oregon (1-3) handed the Colonials their first loss after four victories. Coach Robinson said he enjoyed having his family at the game. "He's a huge basketball fan," Robinson said of the president. "He pays close attention and he's always followed us." Obama received a basketball signed by GW players and coaches, along with a jersey and shorts. Coach Karl Hobbs thanked Obama and his family for attending the game. "Students, this is why you come to GW," Hobbs said.